I may not know from where to start, but I faintly remember when I started. It all started when an uncle of mine gifted me a beautiful dictionary- Collin’s Co-build. He bought that for me along with many books from the legendary Higginbotham's stores in Chennai. He came to see the ailing daughter of his business partner who has just returned home after 10 months stay in Jaipur Hospital. At that time, he just came to offer condolence but he ended up making a friend in his friend’s daughter and on his next visit, gifted her some interesting books to read. That dictionary remained the most cherished gift of my life. It helped that little girl, me to build her vocabulary, learn interesting words and soon she started playing with words, not as pun but poetry. Yes, it was summer of 95 when I chose to withdraw myself away from the friends who made a mockery of my leg or lack of it, until they drifted apart themselves over insecurity and inner competitions. I chose to make new friends; I chose to make friends with poetry and words. I was young and enthusiastic then, full of ideas, full of causes. I started learning 5-6 words a day from my Collins Co-build dictionary and a little encouragement from my renowned English Tuition teacher who said I do not need coaching in English but should not claim a seat that a weak student may require. I couldn’t tell her that I heard a lot about her and wanted to learn more her. I guess she understood my love for the language that was pushing me to spend more time with it. Mrs Papparao admitted me to her elite classes of English, where almost all top students of my batch attended. She divided all the students in to two batches- One slot of weaker students and other for not so weaker. Off course, she allotted me in latter batch. I was happy for her trust in my ability; it was indeed moré than what I had. I started weaving poetries from my words. My words that I would learn from English dictionary and write all of them behind the used old computer paper prints that my dad would bring for me to write scrap. I would write my poems on them and treated them dear. They were indeed dear. They gave wings to my words and thus I started writing poetry. Such was my love for English literature that my first lecture in college turned out to be of English Subject. The chapter was on Pele and I fell in love with My English teacher Mrs. Shyamla Nair. Mrs Shyamala Nair met Mrs. Papparao and once again I started romancing my favorite subject- English language. Maybe it was my love for her that I would never want to miss her class. Or maybe it was my love for creative writing, for Yeats, Wordsworth and more. Somehow my love affair with poems stopped in between my graduation and post graduation years. It is only in MBA 1st year that on the insistence of my professor I sat for a “creative writing” contest and was amused to win 2nd prize. Yes, it was my first official prize. I have won few elocution awards in schools but again they were the contest I participated on spur of the movement when my school house leaders won’t find enough participation and urge me to speak, even though I would be the one who wouldn’t have prepared a word in the entire competition. I spoke with heart and still do. And that is what drew me to Blogging after a long hiatus, in the year 2008 when I wrote my first post for this blog. Yes my lord, this blog. Writing was a freedom that set me free from daily agonies. When I said I spoke with my heart and still do, I was not boasting about self but revealing what influences my style. I poured my heart when I learnt about Curry bashing, about on Gitanjali who committed suicide due to social ostracism on her disability and also gave my unique tribute to Legendary Singer Michael Jackson. And thank you all of you to also like my take on- celebrity Endorsements. Blogging never let me down, it never failed me. It understood me and stood by my side. Blogging is the honest companion, honest master and absolute honest employee that engaged me even when I was lost, alone and heartbroken. Circa 2013, many things started changing in blogging. From the write and inspire, it started moving largely through networking. Yes, your voice needs to be heard, to prevent it from becoming noises. I cannot tell you the joy when a stranger tells you- I love your writings. It inspires me and motivates me to see life outside my comfort zone thinking. Today I have another blog- haute kutir which is primarily a lifestyle blog. It is blogging that made me meet beautiful minds around the world, around the cities I traveled and lived in. From Chennai, Hyderabad, Bangalore, Kolkata, Nagpur, NCR, Mumbai and other cities, some of my fondest memories are purely surrounded with my blogs. Blogging seen a few lows too. 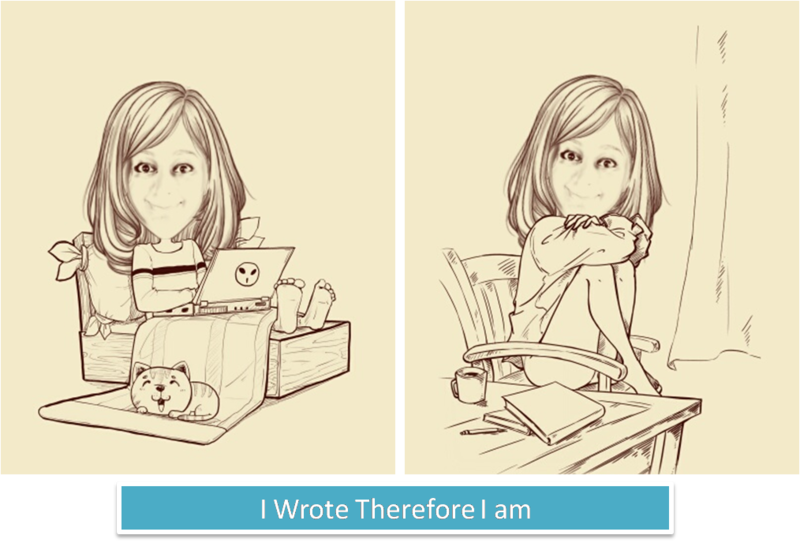 Work pressure, time constraints prevented me to write. And if it was not enough, pseudo-blogging took precedence. From productive networking, it started becoming – “scratch my back and I scratch yours”. I was demotivated and withdrawn. And then in true Munnabhai MBBS style- Ek Din Blog mohalle mein Blogadda WIN aayi [One day Blogadda came]. It announced a one of its kind blog awards and I was smitten. My joy saw no bound when I saw my blog shortlisted for “Best Blogs in Creative Writing”. Alas, I could not win the award that time and was very bitter and heartbroken. When I gathered myself, I realized how the nomination and appreciation, per se were my best prize. 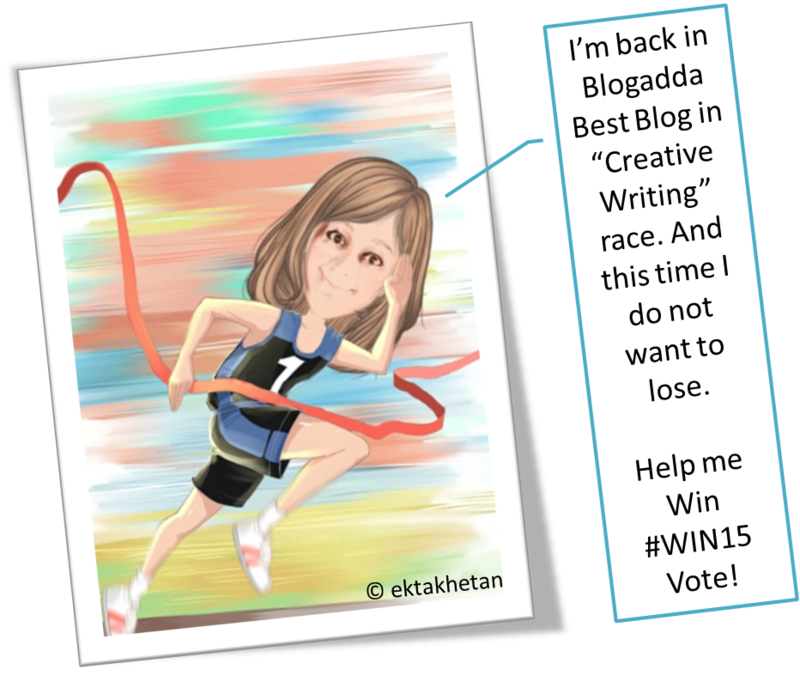 Circa 2015, Blogadda announced chapter two for WIN and much to my surprise my Blog is re-nominated in “best creative Writing award category”. Whether I win or not, I am not going to stop WIN [ning]- i.e. Write – Inspire – Network. Let’s #CelebrateBlogging , it is an everyday festival! And I still think that I can save world with Rhythm and Rhyme. IO have voted for you Ekta.may you win. You kept belief in your work, Ekta, and it surely is paying dividends. You are the best in this style of writing and continue to inspire others.